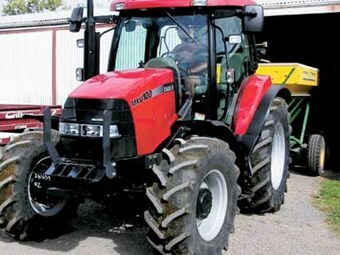 As a first or even second machine, the Case IH MXU100 is an ideal sized tractor for many farmers who want a unit that can tackle the jobs a 80hp or 90hp tractor won't come near. A Morrinsville farmer since 1986, Tom Mourits milks 190 Jersey cows through an 18 aside herringbone shed on the family's main 53-hectare property. Five years ago the Mourits decided to grow the business but couldn't purchase any adjoining land, so they bought a second stand-alone dairy farm 8km down the road, next door to the Waitoa dairy factory. A Lower Order sharemilker runs that 90ha farm, milking 285 crossbred cows in a 20 aside Alfa Laval shed. Owning two reasonably sized dairy farms, Mourits chose a Case because he has had such a good run with his old 60hp 4WD Case. Without prompting, he made a special point of satisfaction with the service received from his local Case dealer, Piako Tractors. He did shop around, and said he got a good tractor and value for money. 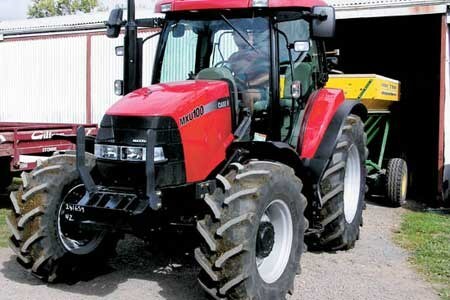 And like many farmers, he chose to go to a 100hp model so he can do those extra jobs with less effort. Top of the list was safely towing his heavy (when loaded) feedout wagon. There are a lot of features packed into this turbocharged four cylinder short-wheelbase machine, the smallest in the MXU range. Visibility in every direction is excellent, thanks to the seamless side windows and thin-seam front window. The rear vision mirrors are huge and the night lighting exceptional. Our test machine featured an open/close sunroof, which made a big difference to the natural interior lighting, and included a simple pullout cover for night driving. The flat floor is lined with soft, thick rubber matting, which I found quite comfortable, as it seemed to reduce engine and movement vibrations through the feet. Control position is as good as it gets where everything was set out to be within easy reach, without having to strain your back while twisting around to work a knob etc. The push-button diff. lock can be used in automatic mode, where the diff. lock functions when driving in a straight line and clicks out automatically when the driver makes a turn, before re-engaging again. In the left hand corner of the cabin is an odd-shaped tall removable storage box. It has a relatively small opening at the top and widens with the shape of the cabin. I can understand the shape fits well into the corner, but it means if you put your lunch inside it you have to reach a long way down to retrieve it. No big deal, unless you're hungry. On the other side of the fence the passenger seat is a beauty. Wide seat and back, thick, folds up easily - that's enough. 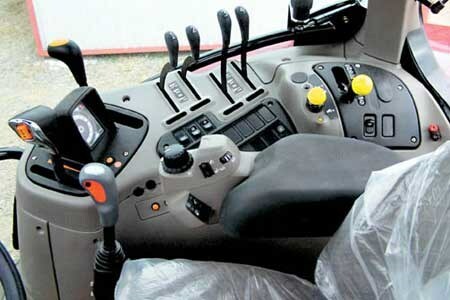 The MXU100 has a hand throttle with an up/down button for moving through the gears. Fitted to the back of the push-pull throttle is another button, which has to be depressed simultaneously with the up/down button in order to change between any of the four speed ranges. Although, to get into the two higher (or lower) ranges, the driver has to clutch and manually change gear on the MXU100 model. I guess you can't have everything. Each speed range has four gears, totalling 16 in each direction. After warming it up, I found some changes were a little jerkier than others. After sighting the gear range graphic on the side window, we found the reason - a couple of lower gears had slightly larger gaps between ratios. Having said that, I've driven tractors which have an overall smoother gear change, and others which are worse, so I guess it's par for the course. When moving off, the shuttle direction change system felt like it had too much inertia during the initial take-up phase. On take-off, at first there was little movement, before a rush kicked in, which would probably make it a little more difficult when using the front-end loader. A bit like an automatic car when you put your foot down. I later learned the take-off speed is programmable. The 98hp two-valve engine (at 2200rpm) comes from the European Engine Alliance (EEA) factory, an all-new joint venture engine from Case IH, New Holland and Cummins. We couldn't put it to the test on Mourits' flat farm to get a feel what its torque was like. Rated at 425Nm torque (at 1400rpm), the engine has individual Bosch injectors. 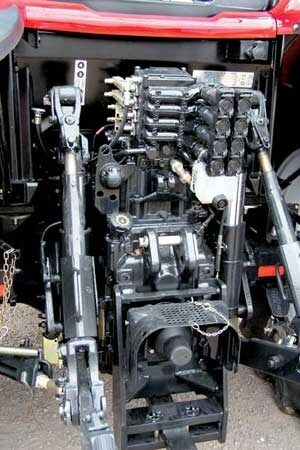 Of monocoque design, the engine in this 4560kg tractor is strong enough to form part of the chassis. With the bonnet up, super-easy access to the radiator can be obtained through fast removal of only two pins, which allow the oil and air conditioning radiators to slide out of the way. A 113 litre per minute oil flow is nothing to sneeze at on this sized tractor, which easily place it among much larger tractors, and is one of the reasons that attracted Mourits to the MXU100. Up to 95l/min can be supplied to any single outlet, while a separate oil pump drives the hydraulic steering system. Another big plus for Mourits is that it came standard with four hydraulic outlets at the back - again, more than most for a 100hp machine. Plastic guards cover the front wheels but one of the biggest visible differences compared to other manufacturers are the extra large rear wheel mudguards. They extend a long way past the rear wheel, and well outside each rear wheel to offer better than usual protection from mud-fling. Fitted on each rear mudguard are remote linkage rise/fall buttons, plus a slow start button for the three-speed PTO drive unit. Quick hitch and easy adjustment of the horizontal stabilizers were features also demonstrated by Mourits. The "in axle" oil immersed disc brakes on the MXU100 hauled the tractor to a stop as advertised, and while doing so gave good feel to the driver. We didn't fit it during our test, but a good-sized Manip MP90 front-end loader, with a 2m bucket, came with the Case MXU100. I put the decibel meter through its paces, but the readings kept jumping about too much to record any stable reading, although it did calm down somewhat after we figured out the front wheel hugging barking dog was influencing the meter! There was still a background noise that we couldn't make out or actually hear, however inside the cabin it mostly gave a reading in the 74dB area. Not a bad figure, which reflects how quiet working inside a cabin tractor really is compared to a ROPS machine. In fact, our recordings measured a marked drop in sound levels as the revs picked up both inside the cabin and during drive-bys. The Case MXU100 has many features which would attract buyers to it, just as it did Mourits. 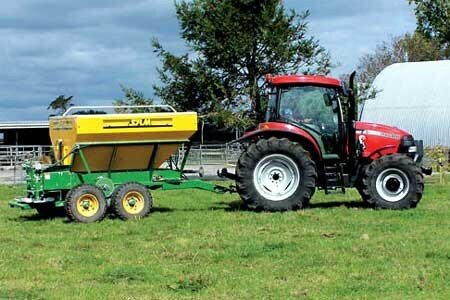 The ability to easily lift, turn and tow most common implements a farmer would use on a daily basis, in comfort, must make this a tractor to look out for.